Life can be tough, but I know that we can be tougher. I love this quote. Every time I think that life is just getting too tough to handle, I think of this and I know I can deal with whatever is thrown at me. So I am going to leave you with just this quote today because I have an extremely long TO DO list today. P.S. Thank you all so much for your sweet words on my impending move. I am excited and a little scared all at the same time. So much to do in the next few weeks, and of course there is still my business to take care of. I will get it all done though, because I know I am tough. You are in my prayers and thoughts today. I am always here if you need to talk. Stay strong dear friend. You can do this! You are tough! I love this quote, it will help me as I continue down my hard path! 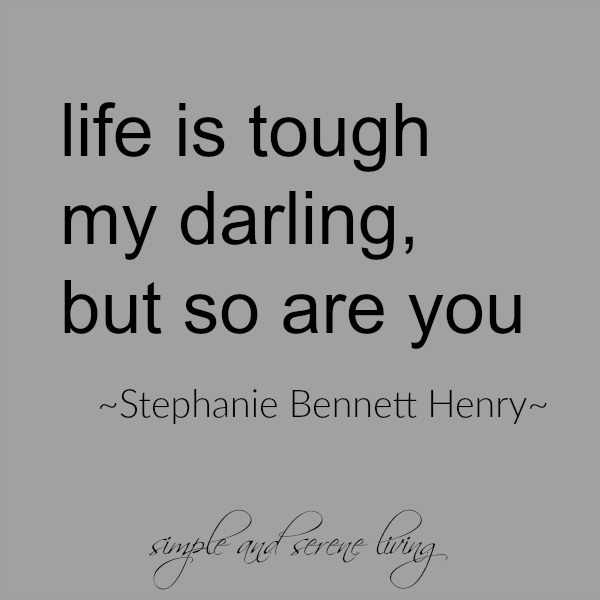 We have to be tough in life, don't we?! Press on Laura! I do like that quote! I'm glad it is helping you through this very busy time. It's a good kind of busy though. Yeah, I'd say we're pretty tough old birds, wouldn't you?